COMMENTS: We love using these for our "double shots" of soy tarts. Display well, easy to fill and holds perfect amount of wax for an average burner. 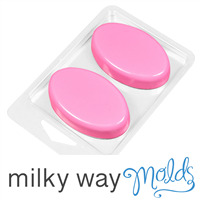 COMMENTS: These are just the right size to take on trips,great for small amounts of soap left over after filling a molds to. COMMENTS: I use these to make sample packs of bath melts. They can take a pretty high pour temperature and the product still pops out easily. Very pleased. COMMENTS: These were perfect for my solid sunscreen bars! They held up to the heat and just looked awesome. COMMENTS: I was hoping to be able to get a couple uses each out of these but they served there purpose and for the price cant go wrong. 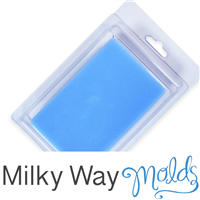 COMMENTS: The 2 bar small clamshell makes it so easy to make travel soaps and guest bars! It's such a breeze to make some soap up and simply pour into these babies and wait for them to harden, then put the lid on and slap a label on them! I love how cute they are! Great price for so much as well. COMMENTS: ....I am just not sure how to best use these! They are cure and convenient, I just haven't gotten that great idea yet! COMMENTS: These make guest soaps so much easier! Great packaging and convenient to label. They look professional and are a good selling point for travel as well. They also ship great! "Can each piece of soap be a different scent or should they both be the same scent?" Staff Answer You can certainly make them two difference scents if you wish. You might want to use fragrances that compliment each other since they would be in the same clamshell. "Can this be used with CP soap or only MP?" Staff Answer Yes, as long as your soap does not maintain a prolonged temperature of 130°F. If you allow your soap to gel, make CPOP or HP then the plastic will warp. "How many ounces of soap does each cavity hold?" Staff Answer As listed on the website, it makes (2) 0.86 ounce bars.